UPDATE: Enjoy this tour of our former home. We’ve moved and are giving our new-to-us home a complete remodel. I’ve completely changed my style! Click HERE to take a look. Welcome, welcome everyone to my fall tour here at Worthing Court! I’ve been a busy bee and am so glad that you all came by to check out my fallishness. ☺ So come on in, make yourselves at home and take a look around! This is the first time in many, many years that I didn’t use my old reliable pumpkin wreath. You can read all about how I transformed it from year to year and made it feel new HERE. This year I splurged on a fabulous hanging basket! For fall, I spiffed it up with some burlap ribbon and a mini chalkboard. I especially love the long length of it and can’t wait to use it in all sorts of ways. 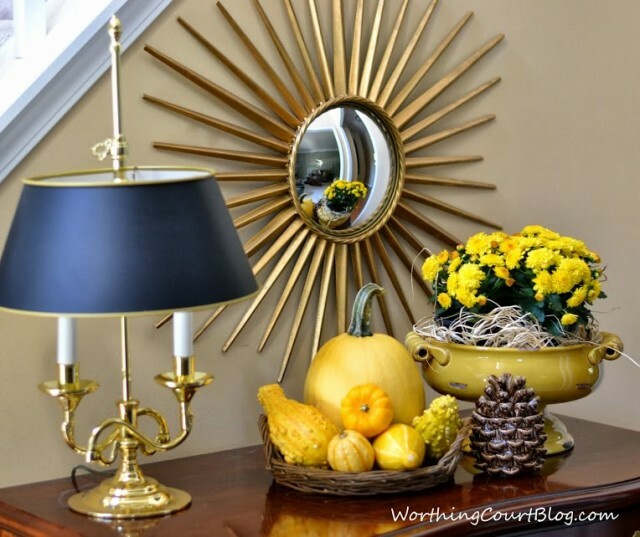 Come on into the foyer where I kept things super simple with a little vignette of mums and a yellow pumpkin and gourds on the chest. I was inspired by the beautiful buttery yellow pumpkins that I found at a local farmer’s market. The person who sold them to me said that they should have been white, but they were planted near traditional orange pumpkins so she figured that somehow the orange ‘influenced’ the white. 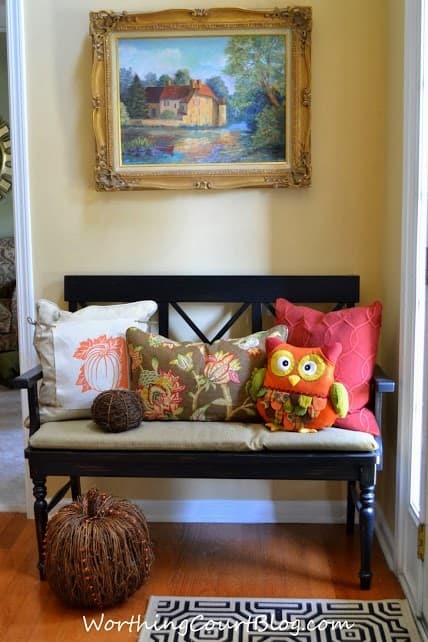 I added a couple of colorful fall pillows to the bench in the foyer too. 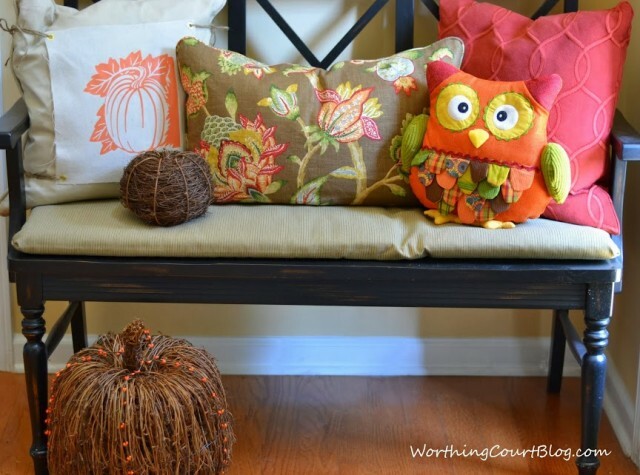 You may recognize the pumpkin pillow cover that is just one of several changeable, no-sew pillow covers that I shared HERE. They are so easy and fun to make! 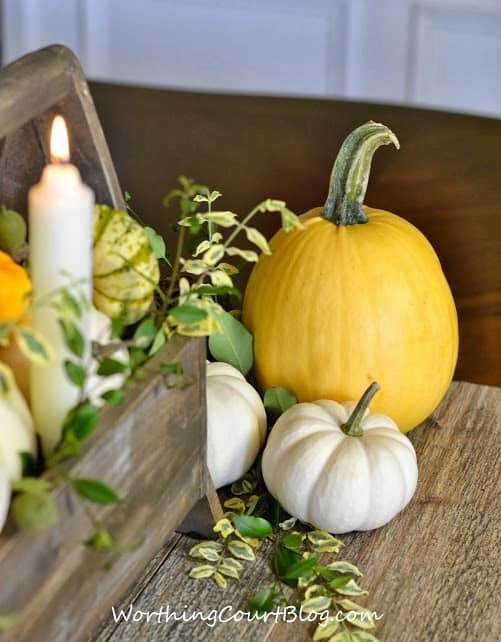 I dressed my dining room table with more yellow pumpkins along with quite a few white ones and sprigs of fresh greenery from my shrubs. The base for the centerpiece is brand new wood that I made to look like old barn wood. You can read all about how to make some for yourself HERE. I borrowed it from my basement where I use it as a backdrop to the vignette on top of my media center. It works great for adding a touch of rustic. You can see it in its normal home HERE. And I borrowed the wooden toolbox from my kitchen, where it is usually filled with cookbooks and other kitcheny paraphernalia. 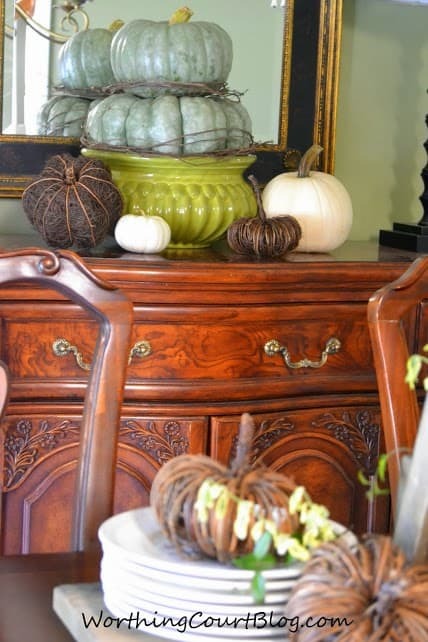 Over on the sideboard, I added a topiary of green heirloom pumpkins mixed with white and twiggy ones. Love their reflection in the mirror. Back in the family room, I’ve gone back to the traditional rich colors of fall that I love so much. My fall mantel and hearth were inspired by a couple of things. First of all are these fab galvanized metal containers that I found for a steal at 70% off at a local garden center. My second inspiration is the reproduction vintage olive bucket that I found earlier this summer. Even though I kept it filled with a ginormous fern for the summer, I knew all along how I would put it to use in the fall. I’ve teased y’all a couple of times about the fall chalkboard that I put together. It’s actually a printable that I created and I’ll tell you all about it in a few days. UPDATE: Click HERE to get the free chalkboard printable available in 8 x 11 or get a large poster size for only $7 from a store like Staples. I know it is huge (36″ x 48″), but this is a two story room and it needs a large piece of art over the fireplace. Hang with me – we’re almost done. Come on into the kitchen where you can relax and have a cuppa something cause I know this is the longest post in history! Oh, fresh sunflowers – how I love thee! They are happy flowers and make me smile. Did you know that their blooms open and close in reaction to light? Neither did I until the florist told me and then I watched them for a few days. Looks absolutely beautiful! I enjoyed the tour so much! Your home is gorgeous Suzy! I especially like the bench and pillows AND your front door is so welcoming. Love how simple the mantel is and all the rustic details. I adore sunflowers too. There’s a huge field full of them near our home, I always imagine stopping by there for a photo shoot with my kids. I love fall and all that goes with it! Loving the yellow pumpkins!! The display on your dining room table is just beautiful! Thank you for the tour!!! Love the color of the fireplace wall in your Family Room. What color is it? 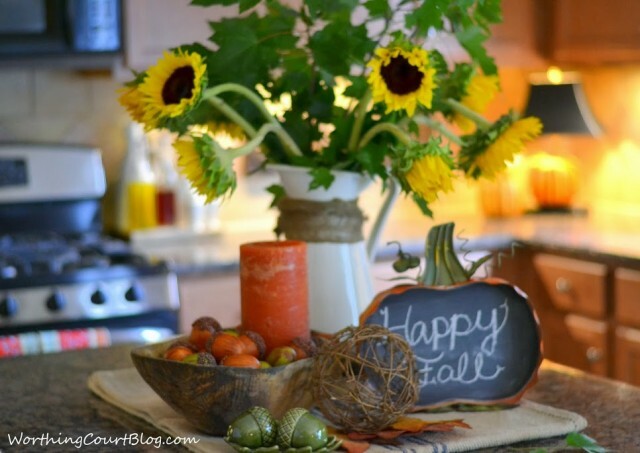 I LOVE your fall décor! It looks so warm and welcoming. Your house is one of my favorites on the tour so far! I have never seen yellow pumpkins before. I love them, even if they were an accident! Your home is gorgeous! 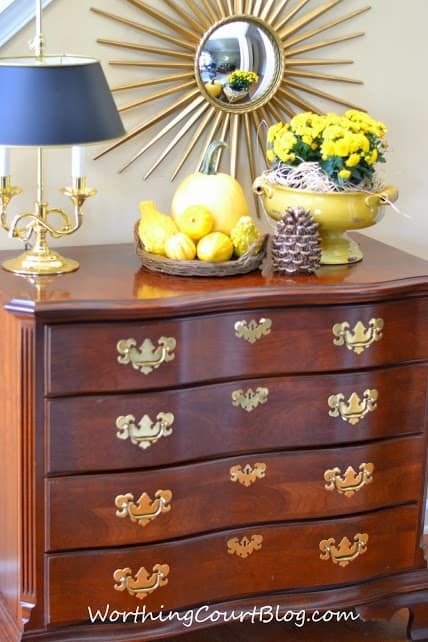 Your fall decor is perfect! Great tour! 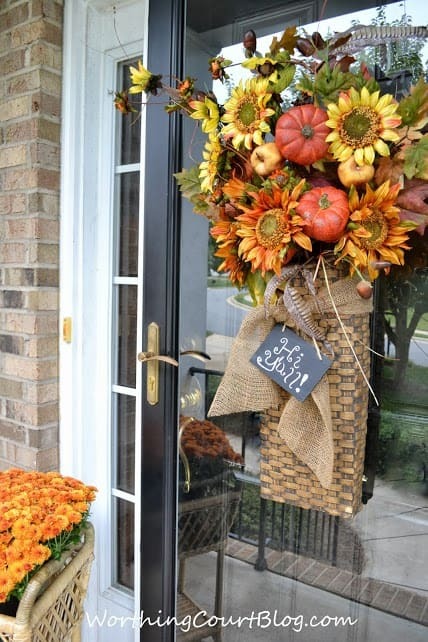 Your fall home tour is simply stunning! Thank you so much for the amazing inspiration! Now if I can just find me some of those butter yellow pumpkins – love them! I think you may have kicked off a new trend and a new sensation! 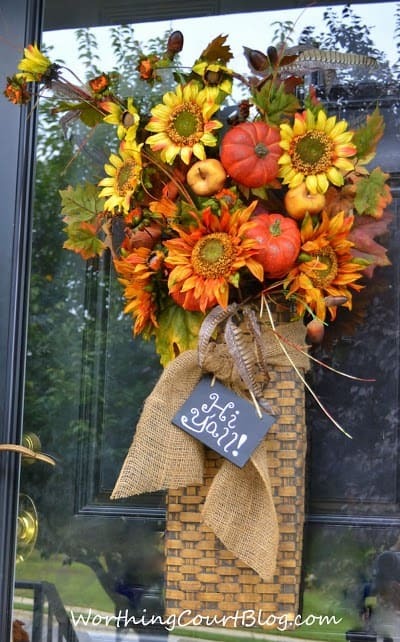 Suzy, your Fall tour was wonderful….beginning at the front door! 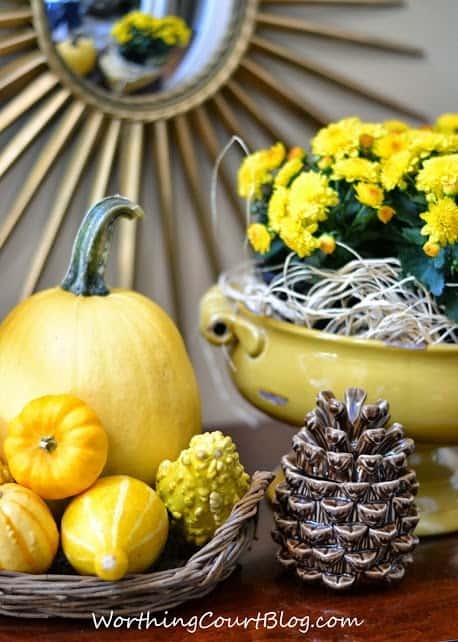 Love the basket; and those yellow pumpkins are amazing! All of your fall accents are beautiful! 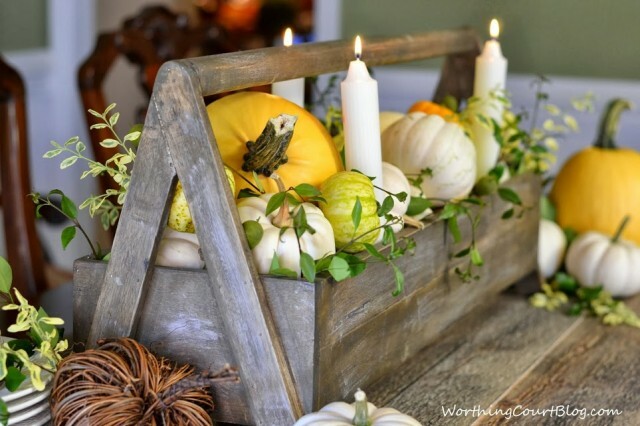 Beautiful photos and fall decor…especially your toolbox. 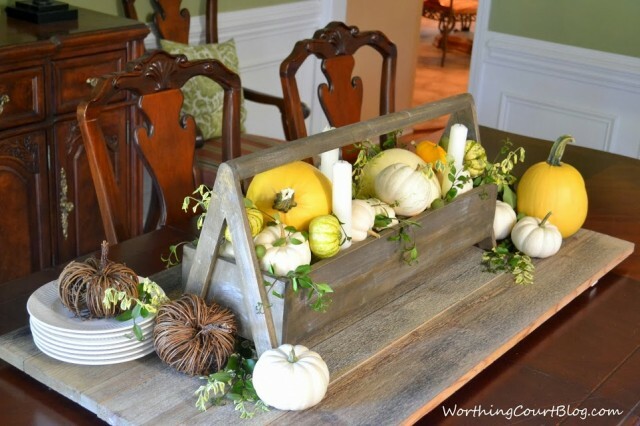 I used my husband’s for my fall dining post, too! 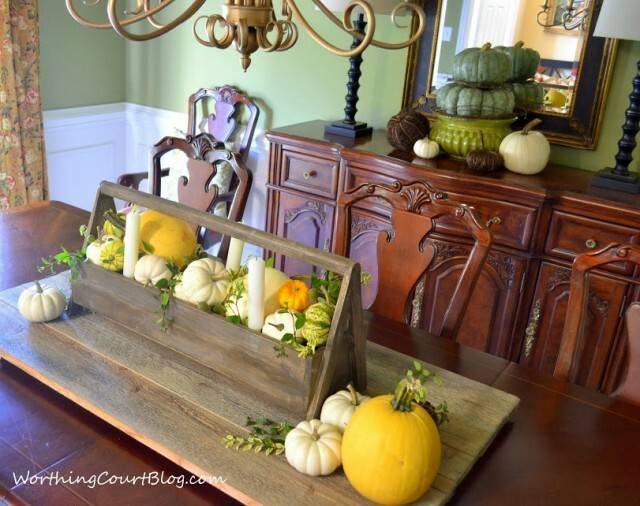 Beautiful Fall home tour 🙂 The table scape really got my attention! I love seeing pictures of your home, it is lovely!! So charming and inviting- your tour is beautiful and loving that basket and the stack of green pumpkins! I just found some of these yesterday at the store- they are so fun! Oh Suzy, this is so beautiful, I really enjoyed your tour. The two pumpkin topiary are so pretty and the toolbox on the table is such a wonderful display. You always do such a great job. I am back, I forgot to mention the piece on the front door, GORGEOUS!! I am in love with your toolbox on the table. It matches the piece of wood that you aged so well! Your whole home looks wonderful though! I loved it all Suzy but the dining room table was my favorite! I love it, Suzy! Great photos and a beautiful home. 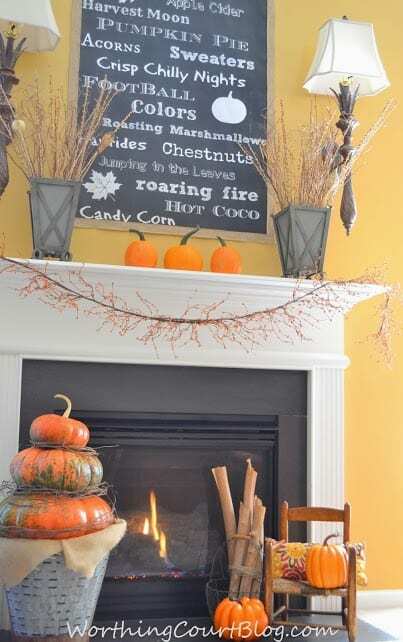 I adore the chalkboard over the mantel. You have to tell me how to do it ’cause my handwriting stinks! I love the way you incorporated the natural elements (and I love now that I’m mostly done decorating I can find pumpkins at the grocery!) Love the metal containers, too. Great job! Thanks for helping us all with the fall tour! Love ‘ya! Suzy, What a welcome you gave me at your front door! Such a pretty arrangement! Each room has such beautiful and festive vignettes. Your centerpiece box is amazing! I thought it was old. I am wild with how you filled it! Where on earth did you get yellow pumpkins. They are amazing with your dining room vignette. I need to take a lesson from you! I can’t wait for the tutorial on the chalkboard. I love love love it! I sure can tell you have been very busy getting your home ready for fall. Everything is beautiful! Wow Suzy, you haven’t missed a spot! It all looks wonderful and super fallish and inviting! My favorite is your dining room centerpiece, simply stunning! Suzy, your home is so warm and inviting! I didn’t know that about the sunflowers – now I’m going to watch them the next time I have some in the house. I keep looking at that adorable owl pillow!! It’s just too cute! Thanks for the tour! Suzy, I enjoyed taking the tour through your beautiful home. I love those creamy yellow pumpkins that you found. I had no idea that if white ones grew near orange ones that you might get some yellow ones. Definitely going to try that next year! Oh, Suzy, you always make everything look so beautiful! I love the way you’ve incorporated all your gorgeous traditional decor yet added fun seasonal elements and a touch of whimsy. Gorgeous! Everything looks gorgeous. I love all of your seasonal changes. Your home looks lovely and all ready for fall. Thank you so much for the tour. 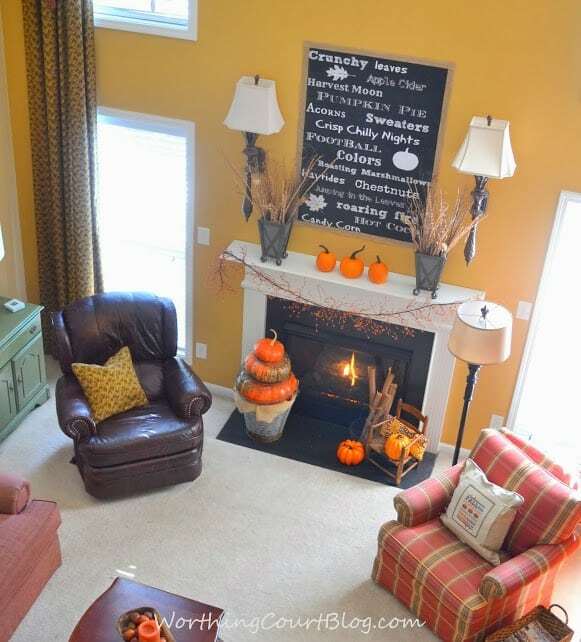 Beautiful fall home tour, Suzy. You did a fantastic job!! Wow..!! 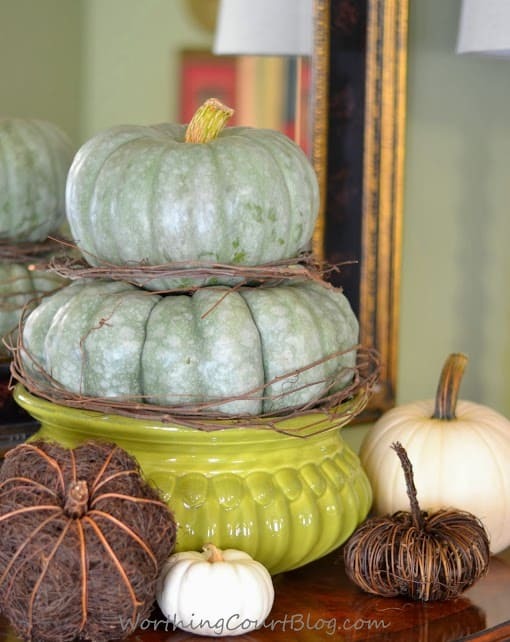 I am loving these different color’s pumpkins. Wonderful..!! Loved all of it Suzy! That piece on the dining table is really great! I love the yellowed pumpkin- I bet she’s right about how it got influenced by the other pumpkins. 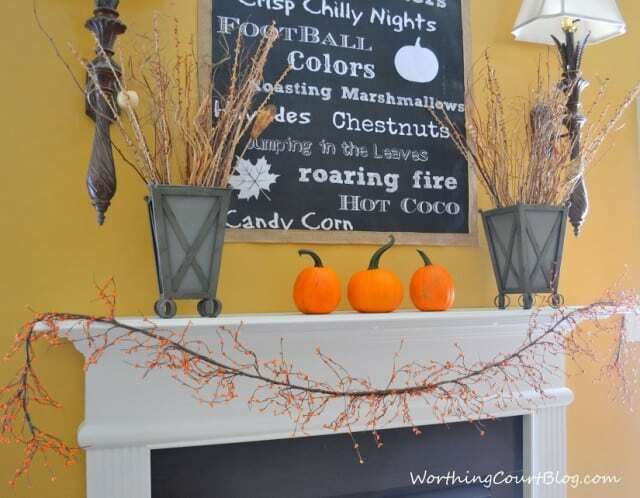 I love the fireplace mantel and the use of the metal pieces mixed in with the fall design. 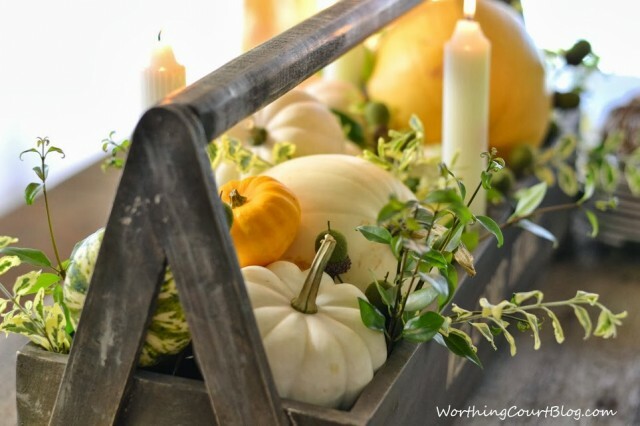 The pumpkins look great stacked on the olive bucket with the burlap- great design as always! 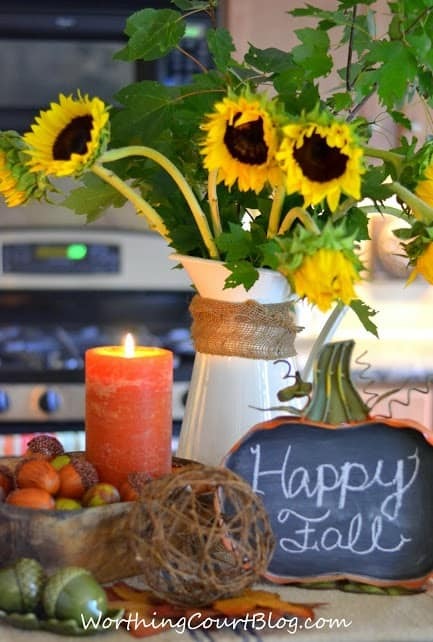 Love all of your fall touches! Hi Suzy ! Another Susie, here. Stopping over from BNOTP,’s Metamorphosis Monday party. 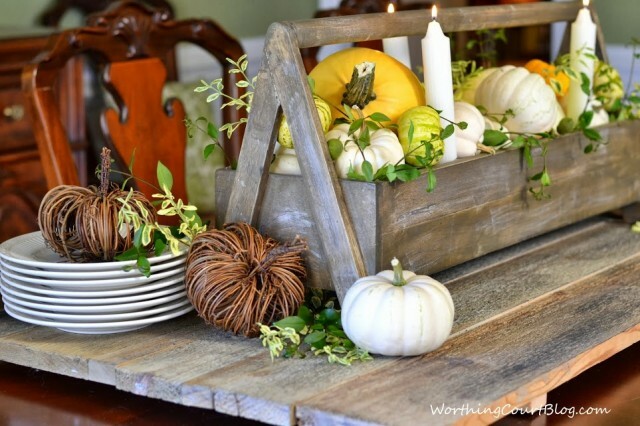 All of your fall decor is pretty, and I especially love the dining room table centerpiece ! 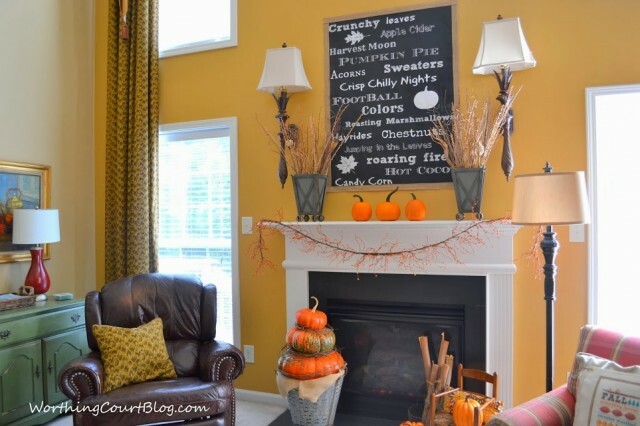 Your home is beautifully dressed for fall! Oh boy, your house has Fallen in such a beautiful way! I love ALL your vignettes and decorations around your lovely home! Thank you for sharing Suzy, so much inspiration! Have a happy week. What a warm and cozy home. 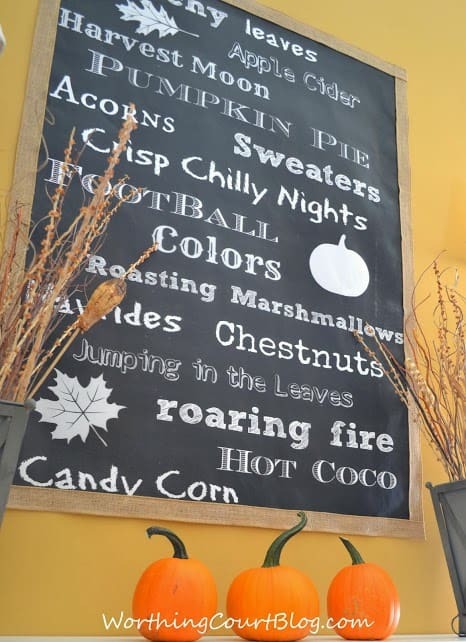 Love all the fall décor. Thanks for the tour. Everything looks fabulous. 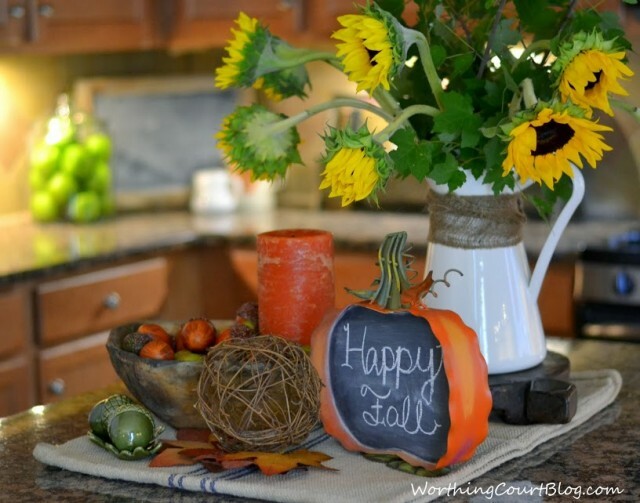 I love all the yellow pumpkins–they are different and fun looking! 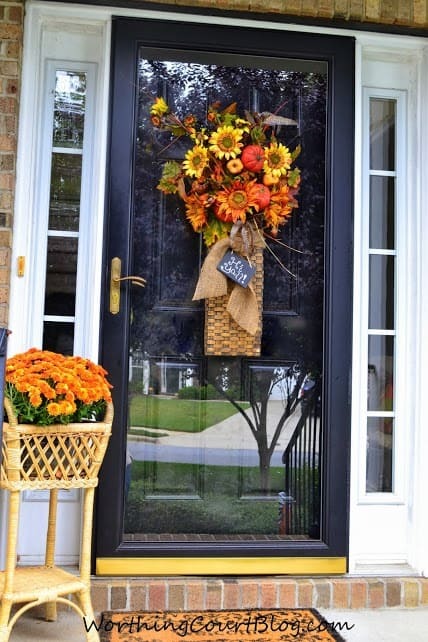 Your home all decked out for fall is beautiful. I Love those yellow pumpkins, never seen any like that. They add such a bright pop of color combined with the white ones. Suzy your home is beautiful! Suzy, Your home is beautifully decorated for Fall! Everything is so pretty and I especially love the table centerpiece and the chalkboard. Thanks for sharing this at the Open House party. Your fall look in 2013 was lovely. It’s amazing how different your fall style changed in a new home, 2016… Just beautiful! I got a lot of ideas off your post that I will use. I have a smaller tool/garden box I’m going to put some gourds in and add some eucalyptus that was in the store too. (I seem to always use grocery bags to bump up the bottom so my gourds and pumpkins go further. I also want to do the wild weed look in your mantle containers with the X. I have some in wood that I’ve just never used. Use for fall!!! Thank you for sharing it all.